U.S. astronaut Anne McClain waves before the launch of Soyuz MS-11 space ship at the Russian-leased Baikonur cosmodrome, Kazakhstan, Dec. 3, 2018. 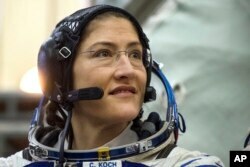 Anne McClain and Christina Koch had been due to step into history books in a spacewalk Friday, during the final week of Women's History Month. "McClain learned during her first spacewalk that a medium-size hard upper torso — essentially the shirt of the spacesuit — fits her best. Because only one medium-size torso can be made ready by Friday, March 29, Koch will wear it." FILE - U.S. astronaut Christina Koch attends her final exam at the Gagarin Cosmonauts' Training Center in Star City outside Moscow, Russia, Feb. 20, 2019. "Anne trained in M and L and thought she could use a large but decided after Friday's spacewalk a medium fits better," wrote spokeswoman Stephanie Schierholz on Twitter. "In this case, it's easier (and faster!) to change spacewalkers than reconfigure the spacesuit." "I'm super disappointed about the all-woman spacewalk not happening as scheduled this Friday but I'm also super supportive of astronauts having the authority to say 'I would be safer using a different piece of equipment'," wrote Emily Lakdawalla, a senior editor at the U.S. nonprofit The Planetary Society.